The first EA UFC was a pretty decent game. They got the fighting down but the game really lacked substance. 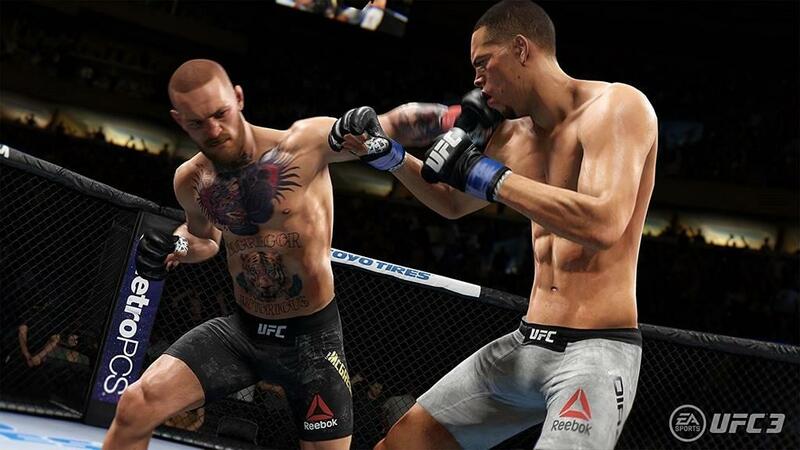 EA UFC 2 added more modes that people requested but it was more of the same, especially the career mode which I felt was worse than the first game. 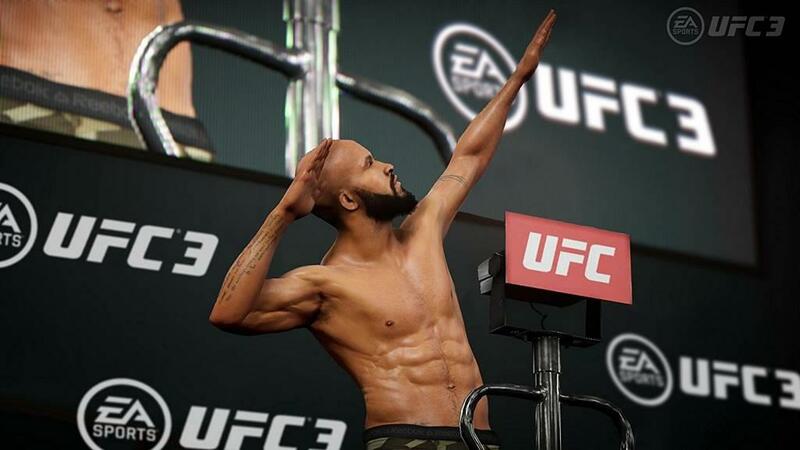 Well it seems like the third time is the charm as EA UFC 3 is the best UFC game that EA has released so far. It's not perfect and it does have some problems, but there are more than enough additions to please even the most die hard UFC fanatics. 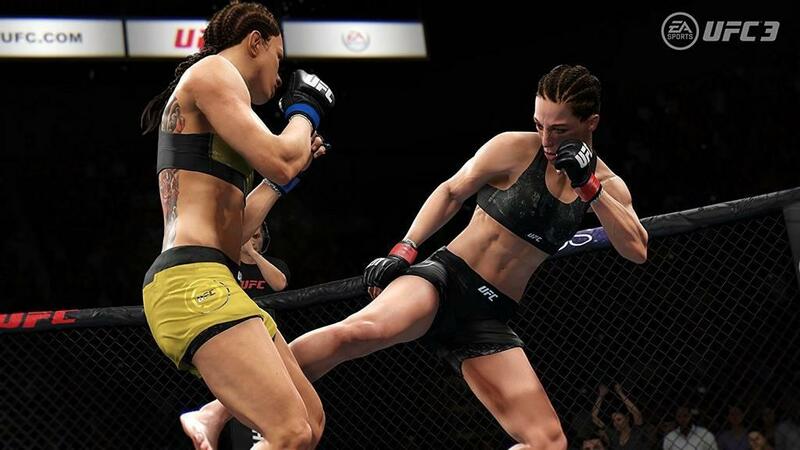 The newest iteration of EA UFC boasts a new animation system dubbed RPM or Real Player Motion, which adds thousands of new animations to the game. Now, every punch, kick, takedown, knockdown or knock out looks fantastic and does a great job of replicating what you see on TV. In the previous game the animations were good but they were a little stiff and characters would also just rag doll to the ground when being knocked out. Now the game looks and feels a lot more like an actual UFC broadcast. It looks and sounds like the UFC. Well, except for Joe Rogan of course, who opted not to record any new voice lines, so all of his lines are either recycled from the older games or taken directly from actual UFC broadcasts. The biggest improvement is the revamped career mode, but it still has some problems. In previous years, all you would do is fight and train, fight and train, but it never really felt like you were doing anything. This year puts a focus on things you do outside the octagon as much as you do inside. After creating a fighter, male or female, and selecting a weight division you will start off in the World Fighting Alliance. After a few fights Dana White will show up and either offer you a contract to the UFC. From here you will need to manage your team in the Octagon and outside. First you need to select a gym to train at. There are only a few to choose from the start but more open up as you make more money. Gyms are important because you need to choose which gym plays to your strengths. For instance, I was a submission specialist so I picked the gym that focused on Brazilian Jujitsu. Gyms allow you to learn and apply moves and perks which focus on your play style. Each week you have 100 points to spend on activities. These could be boosting your basic stats, learning new moves, sparring or hyping up your fights on social media. You need to find a balance between the two. Train too much and your fights will have no hype and thus you won't be able to move up the UFC fight cards. Focus too much on hype and you will never raise your stats high enough to win your fights. Here is a word of advice, do not constantly hype up your fights. Your UFC contracts depend on how many fans you have. I went 10-2, got a new contract and because I hyped myself up too much, I was getting main event / main card fights. I got decimated and my 10-2 record quickly went to 10-8. As you perform activities you will notice a meter starting to go up. Keep and eye on this, as this determines your training level. You will want to get it up to around 105% which means you will be at peak fitness. If you go over, you will suffer stat penalties which could affect you in your upcoming fight. Learning new moves and sparring is extremely important. While basic training and social media posts are nothing more than clicking through menus, training allows you to take part in challenges in order to learn new moves and perks. For instance, you may be tasked with preventing your opponent from transitioning on the ground for 30 seconds. Doing so might reward you with new transitions, moves or submissions. Sparring lets you fight against the CPU for 60 seconds and the CPU will mimic your upcoming opponent. This is extremely important since you get vital information about your next fight. For instance you may get information that your next fighter has amazing ground game so you need to keep the fight on your feet. The biggest problem with the career mode however is the rivalry system. Rivalries don't happen at random, nor do you get to determine who your rival is. Rivals serve really as more like boss fights that are trying to prevent you from rising up the card. In theory this makes sense, the execution isn't that great. The problem is that you could go on a incredible winning or even undefeated streak, but won't be able to progress because you didn't beat your rival. The opposite is true as well. If you are losing tons of matches and then beat your rival, you may get a title shot. That doesn't make any sense. It seems like the game is on a "three strikes" system as well. Despite having a decent record and , I got booted from the UFC and my contract wasn't renewed because I kept failing to beat my rival. The funny thing here is that if the UFC doesn't renew your contract, that's it. Your fighting career is over. Okay, I know this is a UFC licensed game so I wouldn't expect them to add a "go to Bellator" option, but come on, you couldn't have at least sent me back to the UFA to finish my career and retire? At the end of the day, the career mode still isn't perfect, but it's still a massive improvement over previous games. In terms of other game modes there is of course returning features like the ability to create your own fight cards, and knock out mode, hilariously commentated by Snoop Dogg but there are new ones added this year as well. Stand and Bang completely removes the ground game, takedowns and grappling. Knockouts can happen in a single hit so this mode is mostly about positioning and striking at the right time. The other new mode is Submission Shootout. In this one, all punching and kicking is removed. The only way to win is to takedown your opponent and make them tap from a submission. These modes are only fun against the CPU a few times and are way better if you are playing with a friend. Unfortunately the modes only support offline multiplayer. Not sure why they would put these modes into the game and not implement multiplayer. The other new mode which is a ton of fun is Tournament Mode. You can create a tournament of up to 16 fighters in a single elimination tournament to crown a winner. There are some modifiers you can apply here as well such as the ability for damage to carry over between fights. Of course there is also the Ultimate Team mode, which is standard for EA Sports titles at this point. As you would expect, you put together a team of fighters and you use card packs to improve them. Oh yes, it's time for those loot boxes and micro transactions again. I know that some people love Ultimate Team modes but personally I just don't find this fun. Constantly grinding money to buy packs and hoping you get what you want just isn't fun. Each card pack has items of different rarity including moves, stat boosts or fighters themselves. You can play the mode solo or compete online. Now for my biggest complaint with the game, which is the ground game. While some new transitions have been added and there are new ways to lock in submissions, the entire mechanic pretty much remains the same. Use the right stick to switch transitions, Its just a slow and uneventful gameplay mechanic that doesn't mirror what you see on TV, especially when you can just keep locking in submissions. This is especially disappointing for me who actually loved the submission system. That I am fine with and I was a Submission Specialist for my created fighter in career mode but being on the ground and getting to those submissions in the first place is quite tiresome and gets old quick. 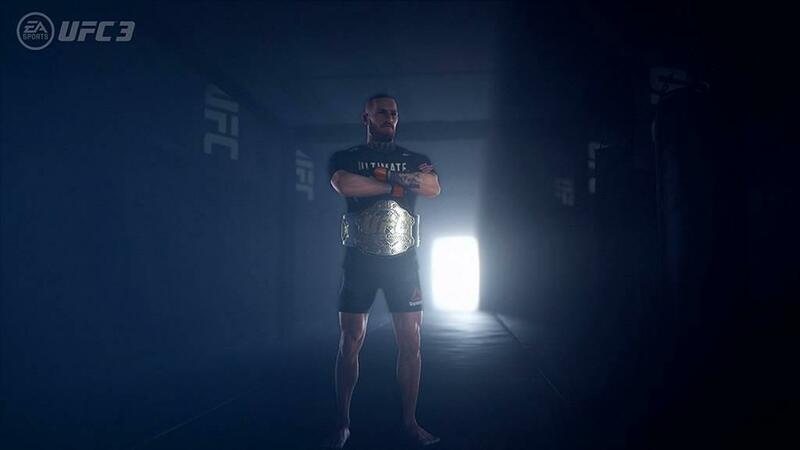 That being said, EA UFC 3 is their best effort yet and it's a fun game, but issues like the ground game and the career mode still not being GOAT just yet keep this game from getting the first round KO it deserves. It's still great enough to get maybe a 2nd round TKO.